I set out to make it for the prizes. You have probably noticed the Zakka Along 2.0 which is sewing through Ayumi Takahashi's book Patchwork Please! 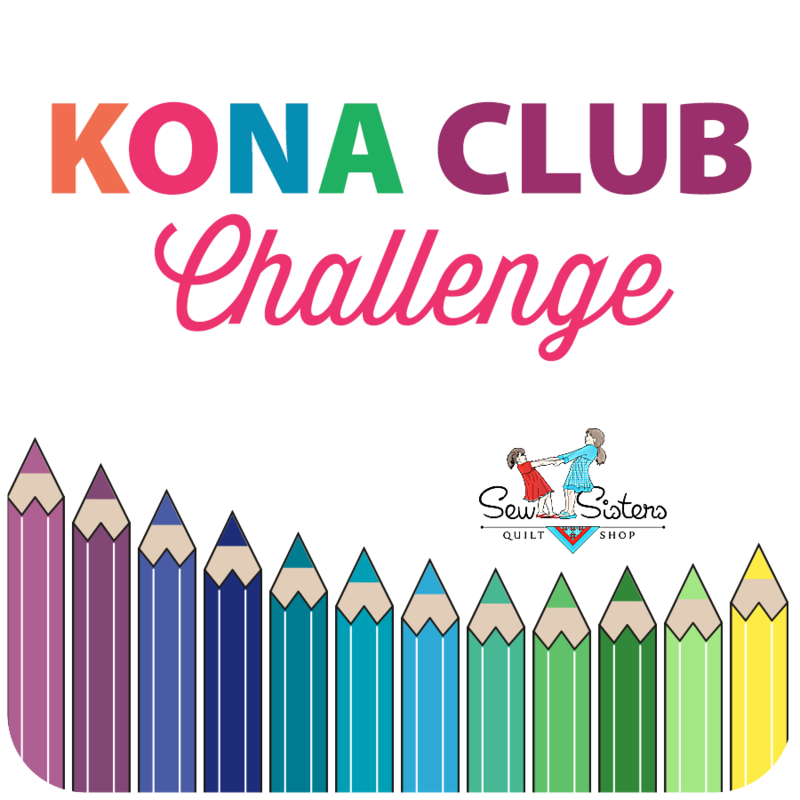 Every week in the sew along there is a prize awarded randomly to one of those who link up a finished project. Well, I really want the prize this week - it is a whole lot of linen and a gift certificate to Pink Chalk Fabrics. I love linen. So last night, having noted that there are not a hundred entries yet so my chances to win were good, I decided that it was worth the time to make the bag to enter. I was not, then, that excited about the bag, and some of the reviews on the internet did not encourage me either. But I got started and finished it this afternoon. My view now is that this bag is great - seriously useful, and not too floppy or weird at all, and I am so glad I made it. First, if you fold it nicely, it will carry as a lovely tidy triangle when it is empty. You can see that I used an Echino linen cheater print and Essex linen in a neutral and also in bright green. I used the neutral linen for the lining and top cover as well as the pocket and handles as I was trying to be at least partly in the zakka spirit of things. I did not have webbing for the handles so I just made some by folding a piece of linen like a binding. The view above shows the pocket. To get it to fold nicely, just set it down and let the sides fall in and then pick up the handles. There is no fussing around to get it to look nice. I did make a mistake making it, but I don't think it changes much. The pattern calls for larger panels on the sides than the front, I believe because the side panels are pleated to allow for expansion. I reversed the panel sizes but it works fine. I needed to remeasure and cut new bottoms, but otherwise the pattern went together the same way. Here is the side without the pocket. Oh, I did not add any interfacing and I used just the Essex linen on the inside, not a plastic coated fabric. I did make the lining 1.5" shorter, as recommended by Krista at Spotted Stone in her post here. Here it it empty on the ground. It can open to basically a circle shape. The book says it is the size of a shopping cart and I expect it would fill very nicely into some of those smaller size carts (there are some at my store on the coast but not here). There is a drawstring cover at the top of the bag to keep your groceries or other stuff clean and dry and from falling out. If you fill it about 1/3 full of folded laundry, it expands to a nice shape to hold it. When you fill it basically full, the ends unfold to fit everything in nicely. And you can overfill it, that top covering keeps things from falling out. Here it is with two large quilts in it. This bag is useful. And when it is full it sits nicely on the table. I see so many possibilities for this bag - for shopping, for going to the beach, for taking fabric to a sewing day, for holding laundry when you are travelling or just in your room, for going to the gym, and whatever else. One thought is that it is so big that if I filled it with too many heavy groceries I might find it hard to carry, so I will be careful about that. In the end, I am very happy with this bag and I will use it loads. And I still want to win the prize, wish me luck. You can go here to see the other bags linked up too. This old box has been sitting here for a little while. I bought it at a second hand store I think 2 years ago, stuck it in the corner and went on to other stuff. But as I started packing to go home yesterday, (yes, a bit early but oh well) I pulled it out for a closer look. She is a Singer Model 15-90 sewing machine. The internet helped me identify her model number (go here) and it told me that she was built between 1948 and 1954. I knew from the information on her motor that she was built in the Canadian Singer factory that was in St. John's, Newfoundland. It operated from 1904 to the 1960's and was huge. I am taking her home. This model can drop her feed dogs and free motion quilt, I gather. First a cleaning and tune up are in order and I will order her some new parts. Very exciting. I have been making blackberry jam and crabapple jelly. In fact I posted an instagram tutorial of sorts on how to make the crabapple jelly a faster way (go here and look through the photos). This method - and all my jam recipes too - is courtesy of my daughter Rebecca, who is an inspired cook. There are the cases of jam and jelly, packed and ready to go. The car, with my guy and my kids, is off tomorrow morning, I fly out the next day. Not even a SUV is big enough for all of us, the dog, and the stuff (especially when you add a lot of fabric, jam and a sewing machine). I will spend the day cleaning up and putting the house mostly to bed for the fall, although we hope to pop in out here a few times before the end of the year. And sewing, well with the decision to go back a week early, my attention turned to harvesting and packing, and being outdoors. I did get Megan's bee blocks off, she asked for arrows of any kind so I just keep making arrows until I had used all the fabric. It was far easier than I expected to make these, and they were fun too. Besides figuring out how to make flying geese, I have been playing with these St. Louis 16 Patch blocks, they finish at 14" and are fast and fun to make - the tutorial is here at Sew with Sass. I wanted it to be calm so used the Kona snow in each block instead of two prints like most folks are making and now it is too boring. So I am adding orange. The fabrics are Lucy's Crab Shack from Sweetwater, which I had left behind last summer. I can't really do scrappy while on holidays as the scrap mountain is at home - maybe I can add something to it with the quilting too. 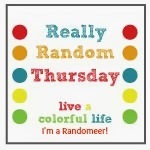 I always enjoy the Random Thursday posts so I thought I would do one and share a couple of other things. My friend Anne at play crafts has added features to her palette builder tool. 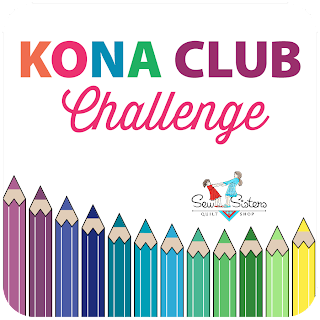 It will now give you Kona cotton colours that match or are close to your palette. So if you put fabric pictures in, you can pick solids that work with its colours. Anne cautions that this is not always going to be perfect, but still, can you see the possibilities - instead of trying to match from the tiny sample card in the terrible light of winter? The Action kivu fundraiser has begun, you can read about it and participate over at Alissa's blog here. This group helps women and children who are victim of the conflict in Eastern Congo. 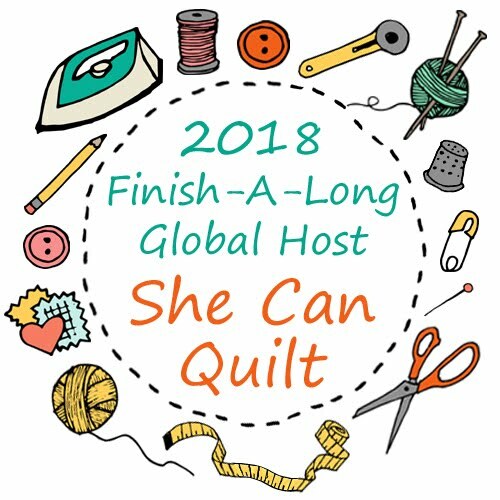 If you have not chosen all your charities for the year, consider this one, and Alissa has some wonderful prizes that quilters love as an incentive. I played with the HST Bloc Loc ruler last night. It is as fantastic as I though. I have always trimmed each hst as I made them, this ruler speeds up the process and makes it so accurate, even when your light is not great. I am totally sold on it and am now planning on making something with hsts. And I have been making more flying geese too (my flying geese experiments are here), the hsts are from the leftovers from the geese. I am going to link to Really Random Thursday and go out to play in my garden. I have long loved quilts with lots of flying geese but I am (was) terrible at making them. They end up too small and wonky. So on my list for this summer break was to learn to make them better. The other night, I started my journey and put my progress up on instagram. I tried different things. Many folks have provided ideas and suggestions, you can read them here, just click on the pictures of different flying geese. I skipped the method where you cut the triangles and sew those bias cut edges together as I knew it would not work well for me and I hate cutting little triangles. So for both blue examples, above, I tried the method, where you put two squares on a rectangle, draw a line corner to corner on the triangle and then trim and press. 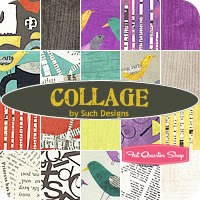 There are many tutorials, the Quilter's Cache one - which I used to refresh - is here. They are too small and the edges are not aligned well. Some of that can be fixed when you join the geese together, but not all of it. Then I tried the "no waste method" (again, I used the Quilter's Cache tutorial here but there are many more available). Again, they look good but are not really perfect, even after trimming - both the orange picture above and the one following are the "no waste" method. So I googled flying geese and also caught up a bit with my blog reading. Last week, Rita at Red Pepper Quilts did an excellent post about the Bloc Loc ruler for flying geese here. I went to the Bloc Loc website and they have videos (go here to watch (the hst video is at the top, the flying geese video is down the page a bit, both these videos are truly worth the time, I'll wait) and a lot of rulers. Other folks mentioned the Quilt in a Day Ruler, so I watched a video about it too by the Missouri Star Quilt Co. - go here. This ruler uses a unique system of building your geese and you get 4 geese for each set of fabrics. And then yesterday I went to the local quilt shops here and at one I found both Bloc Loc Rulers - both flying geese and half square triangles - and Quilt in a Day Rulers. I bought both the sizes they had of the flying geese Bloc Loc Rulers and the smaller size Quilt in a Day Ruler, as together they give me a lot of size options. Here is the result from the Bloc Loc Flying Geese ruler. The geese are perfectly sized because you make them 1/4" larger than you need and trim with the ruler. The ruler has a groove in it so that it hugs the sides of the goose and does not slip about, so trimming is fast and easy. I love it. Here are the geese I made in one hour using the Quilt in a Day Ruler - 28 of them. Since I knew this method had a number of steps, I decided to make a bunch at once so I could chain piece them. This ruler was harder to hold - I need to get that grippy stuff to put on it - but it also really makes the process simple and accurate. This is also an excellent method and ruler. And now the bonus. This morning I tried out the Bloc Loc HST ruler. This ruler is fantastic! I make a lot of hsts and always cringe about the trimming. It is tricky to keep a regular ruler lined up on the seam, and trim. This Bloc Loc ruler holds itself on the seam so your trimming is accurate and fast. So my tip for Tuesday is that sometimes there is a point in investing in the fancy rulers. I am ordering more. I know you can get the Bloc Loc rulers at Sew Lux Fabrics. The Fat Quarter Shop and Sew Sisters have the Quilt in a Day rulers, which I expect are easier to find as they appear to have been around longer. 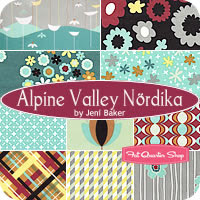 You can also check for them at many of your local quilt shops and several other on line shops too. You can also order Bloc Loc rulers directly from the company too. Two last things, none of the folks mentioned in this post asked me to write it or offered me products or other benefits for doing so. I do recommend both these flying geese rulers, depending on your preference of making method, and I wholeheartedly adore the hst ruler. Second, I am going to be making more flying geese, you might have noticed that these experimental pieces are all from the bundle of Lush Uptown fabrics that arrived last week. 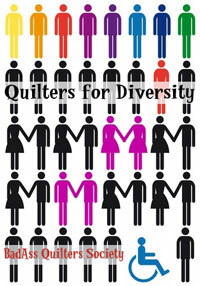 It is my hope to make a bunch more of different sizes, add a variety of neutrals and have a quilt. I may try a few more methods too as I go, I will keep you posted. Well, it is not a ranch, it is a little acreage. I finally was able to set aside the work that pays and the settling in stuff and sew. Here is the quilt top I made this week. 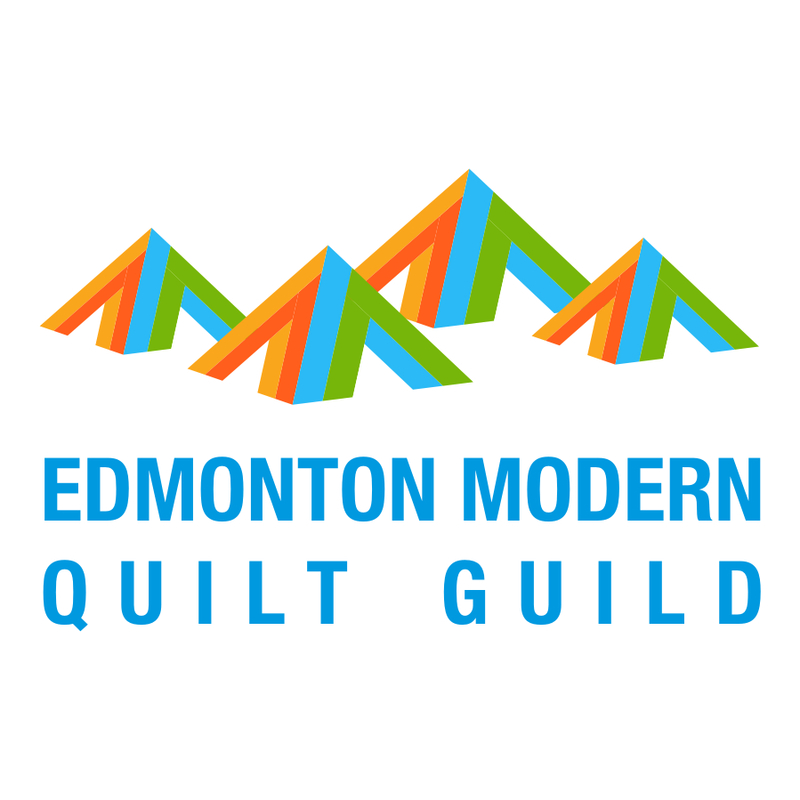 It is the Swirling Medallion pattern from the Quilting Modern book. Although I set out to simply play with this wonderful Briar Rose fabric bundle and learn from my book, it seems that I cannot stick to patterns and I added the extra rounds - the purple and green. And I did not piece the background with a bunch of squares, I cut strips that were long enough to finish the rows. Yup, two almost the same pictures, but it's cute don't you think, and I have been practicing my photography as my FQR photography teacher Judith advised (Judith - today was a cloudy day even). 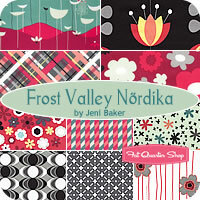 I need to decide about the border of the background Kona snow - the pattern calls for one square wide of background all round or maybe I should make this bigger. It is about 42" square right now. I am leaning toward enough to just bring this little quilt to a 50" square. This morning I drew the winner in my giveway for the $25 Gift Certificate to the Fat Quarter Shop. 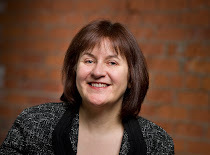 Congratulations to Lisa who blogs at Lisa in Port Hope. Thank you to the Fat Quarter Shop for sponsoring the giveaway and to all of you for the great suggestions of what I should buy. I guess you want to know what I bought. Well I have to tell you first that I had another gift certificate from a friend, and I had the 20% discount code for the Fat Quarter Shop that Fat Quarterly has posted on their blog this week (anyone can use it, just saying, go here to get it). Yup, the whole bundles. It was such a hard choice. I also feel compelled to mention that I might have already recently bought some Lush Uptown, Road 15 and Waterfront Park. Total fabric binge this summer, I blame it in part on the fact that I sticking to the diet that Diane suggested - which is working by the way but slowly. I recently bought a huge cone of Aurafil thread from Cindy at Fluffy Sheep Quilting and she brought it and some other large spools (I never buy just one of anything it seems) to the Fat Quarterly retreat for me. So I thought I would show you how I set it up without fancy hardware - it is too big to fit on the little machine that lives here. The thread sits in a plastic container and threads through a belt hardware piece which I attached to the bottom hook of that artsy beach wood piece that hangs there. And I totally cleaned up my huge mess of threads and bits and tools before I took the photo, my sewing area is seldom this neat. That is where you can often find me while I am out here, in the gazebo under the walnut tree. The wifi reaches my computer there so I can work or use the computer for fun, knit or nap, and it is shady until about 5 p.m. - so it is a perfect spot. But today is rainy and cloudy so it is fine to be inside sewing and stuff. I wrote about this scarf in my guest post at Clover & Violet in the Season by Hand Series here. I explained that I "always carry some knitting" and it is my handwork when I am not able to sew. I am actually a fairly new quilter, having started only 3.5 years ago, about a year before I started blogging. But I have knit since I was 5 years old - my Grandmother patiently taught me. Since then, I have almost always had some knitting on the go, and for a number of years before I started quilting, I knit as much as I now quilt. But right now, while I quilt so much, my knitting is generally simple and colourful projects like this one. I carry my knitting with me almost all the time. Thinking about this scarf brings to mind that song "I've Been Everywhere" (click here to listen to the Johnny Cash version - yes it is country but it is very fun, worth a listen). This is a good thing, as this scarf is for my guy, and he is very much a country music guy. This scarf has been all over my city - to appointments, waiting in line, waiting in the car, waiting for kids, watching television, out to eat, visiting friends, and such. It has been on four long car trips and three air trips - to Lethbridge, Canmore, Banff, Kanaskis, Terrace, London, and Gabriola Island. It has travelled by car, boat, airplane and on foot. It has been stuffed in purses, bags, knapsacks, and luggage. It has not been forgotten or left behind once. It is knit with Noro Silk Garden yarn. I used 50 stitches and knit a k1 p1 rib on every row. As long as you use an even number of stitches, this rib will draw in and the scarf will look the same on the back and the front, which is not always the case with knitting. I worked two rows with one ball of yarn, then dropped the yarn, picked up the other one and worked two rows. Then I dropped the working yarn again and picked up the other and repeated until I ran out of one ball (it was smaller as it had been used for something else first). I did two rows of garter stitch (knit every stitch) at the beginning after casting on and at the end before casting off. You can see the difference between the drawn in shape and the pulled apart shape. The ribbed nature of the scarf also makes it warmer because it is fairly thick. The stripes come from the different colours of the two balls of yarn. As Noro yarn changes colours, the stripes also change colours in an unpredictable manner which makes a beautiful effect. The internet knitters have been knitting striped Noro scarves for years but the idea is not new. My Grandmother also made scarves like this, but out of other yarn. I finished this scarf yesterday and then mended in the ends - the yarn got broken a few times with all that travelling around - and I washed it in soapy water and blocked it before taking pictures. After all that travel the scarf was grimy, but also washing your knits the first time and blocking them is an essential part of the finishing process - it sorts out the stitch tension issues, clears away any remaining dyes and other residue on the yarn and shapes the piece properly. I am linking up my finished hand made project (you can also link some partially finished projects if they are big, Jennie set out the rules at the link) to the Season by Hand link party - go here to link up. There are excellent prizes to be won so if you have not yet linked up your summer hand work, now is the time - it is open until midnight at Jennie's house on August 9. And if you have not yet entered my giveaway, go here and please do so. I am enjoying all the fabric suggestions, and am still undecided. It is beautiful here at the coast, I am sitting in my gazebo listening to the birds as I write this.